Interrupting my posts about the company your child keeps to promote a ten star book on helping children heal from divorce. Get it free today. Jean Tracy does it again. For thirteen years I stopped being a therapist and became a special need foster parent. Over 300 teens lived with my family for days, weeks, and sometimes, months. Most were teenagers and all were in trouble with the law. Sadly, most were also children of divorce. Anyone who cares about children knows divorce hurts. Not only does divorce hurt children, but far too many of those children don’t know how to deal with the hurt. Many hold the pain in, others act out in destructive ways. Either way, the pain of what has happened erodes their ability to cope with the hurt in useful ways. 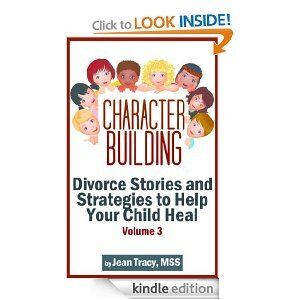 Jean’s Character Building Divorce Stories to Help Your Child Heal provides, not just advice, but Five Star Tools to strengthen what I call a child’s emotional fitness, and others call resilience or Emotional Intelligence. Not only will the child deal better with the hurt of divorce, but he or she will be better prepared to deal with other negative feelings that are part of life. Research shows that talk while helpful is not as effective as tools that aid processing. Jean’s stories start the talking process, but then provide interactive tools that aid processing the pain. In one example a child was helped by her teacher to write letters to her parents telling them she needed to spend more time with each of them. In another story, a boy learns about Skype as a way he and his father can talk across the miles that separate them. Too many parent advice books are fat with explanations, but lean on strategies. Not this one. Whether you are a parent, grandparent, aunt, uncle, teacher, coach, or therapist if you care about children, this is the book you need to buy, read, and share. Jean’s book is free today June 4th and tomorrow, June 5th. Here is the link. Caring parents in an unhappy marriage face a painful dilemma – keep trying for the sake of a child or children versus giving up and seeking their own happiness. Romantic love is a many delusional thing, many second marriages turn out to be just as unhappy as first marriages. So think twice before divorcing and get counseling first. Just so you know my bias, many times during my 42 years of marriage both David and I might have divorced, had we not had children or had we had more money. I am glad we hung on. Doing so, however, has to be a personal decision and children can be just as hurt by living with angry, depressed, or unhappy parents as by divorce. Life is a struggle and relationship probably one of the places we struggle most. With the right tools, however, we can all move forward toward the good life. For all you do, thank you and if you know children and parents dealing with divorce, get Jean’s book. My eBook When Good Kids Hang Out with the Wrong Crowd is also free until midnight June 5th. Reading either is good, but for Jean and I writing reviews ,while not obligatory, are definitely priceless. This entry was posted in Parenting Issues and tagged Book revjew, Emotional fitness, Emotional Fitness Training, Emotional Health, free on Amazon Kindle, Healing Children of Divorce, Jean Tracy, Katherine Gordy Levine, Parenting advice, postaday, teens, When Good Kids Hang Out with The Wrong Crowd. Bookmark the permalink.